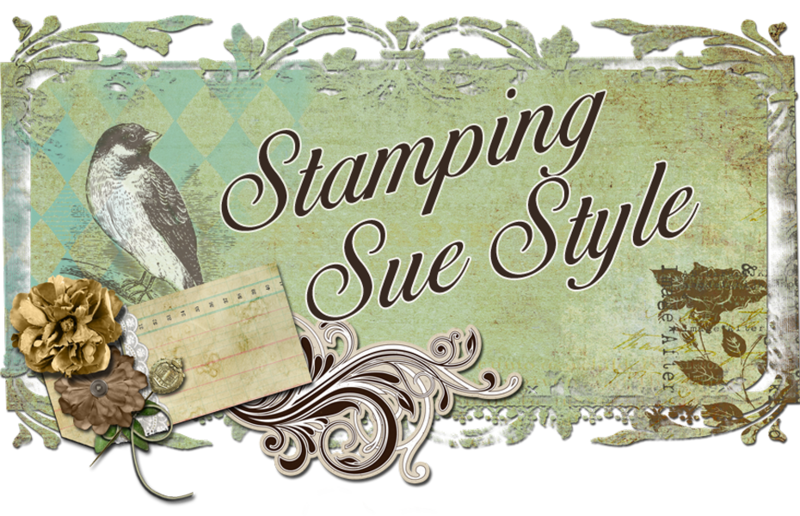 Stamping Sue Style: Look to the stars ! It's been ages since I just sat down and crafted for enjoyment without having a deadline to meet. 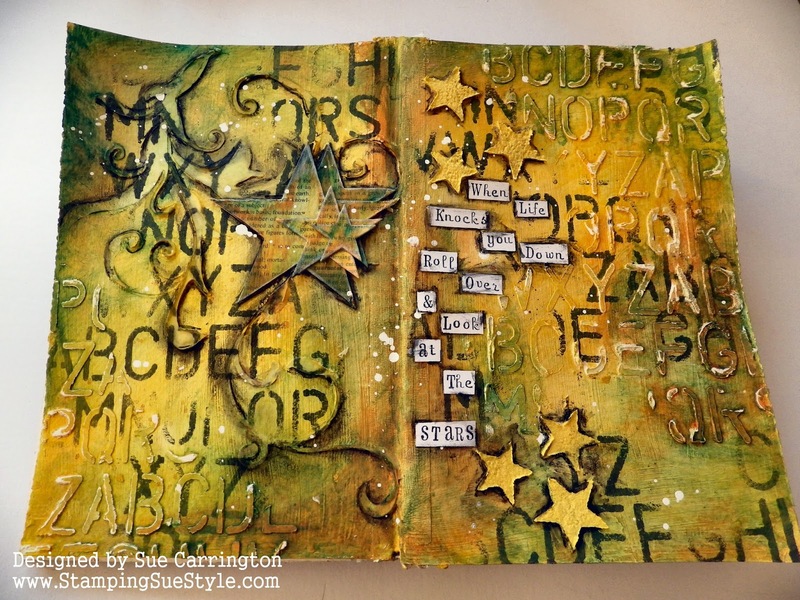 So, the journal page I'm sharing are a few hours of painty enjoyment ! 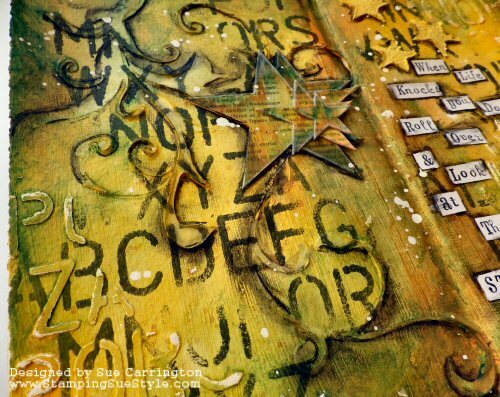 I was inpsired by my very good crafty friend Ruth's journal page, that you can see here, and it got me thinking about the Stacking Stars die (that I've never used!). I started by gessoing the pages then used the Donna Downey alphabet stencil with Little Black Dress Fresco Finish paint. 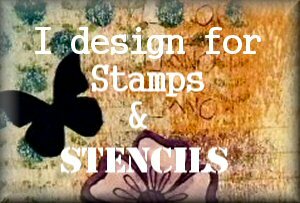 I used the stencil again with Grunge Paste. To define the flourish I used a Stabilo pencil and a water brush, drawing around the edge and then blending with the brush and smudging with my finger. I covered some card with dictionary paper and die cut the stars. I've used Fresco Finish paints to colour them, then stacked them and used the Stabilo pencil around the edge. I lightly sanded the Grunge Paste letters to make them a little shabby in appearance. I went looking for a quote and found this one, 'When life knocks you down roll over and look at the stars'. It's funny how some quotes just seem to hit the right note with you and this one did just that! I stamped all the words using those little alphabet sets, glued them in to place then used the Stabilo pencil around the edge of them too. 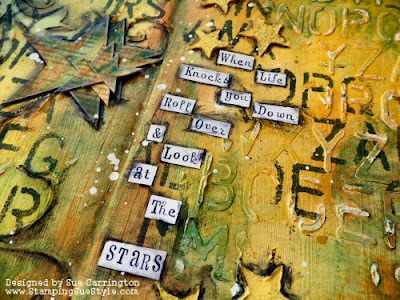 The smaller stars are made from Fiber Paste that I've mixed with a little Yellow Submarine then spread through a PaperArtsy stencil. I left them to dry on a paper palette sheet, then when they were ready they were glued in to place then I added the shadow with the Stabilo pencil. To finish I used my white Posca pen and flooded it and then flicked the excess over the page. 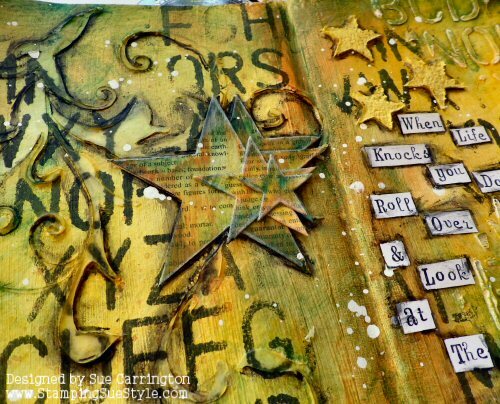 I'm also entering this journal page into the That's Crafty challenge which is Wish upon a Star and the Simon Says Monday Challenge which is Anything Goes. Brilliant page Sue! Love the effect of that translucent embossing paste and the stacked stars. The quote is a really good one too! 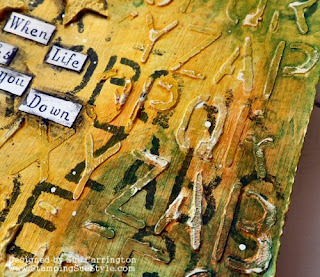 Gorgeous Sue, love all those amazing layers and textures and the quote is perfect! 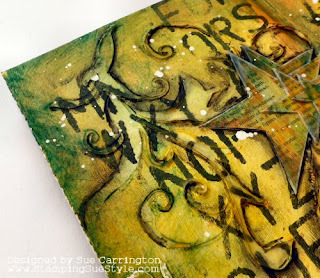 I never would have thought to stencil fibre paste onto a separate sheet to dry and then add them to your journal page, wonderful idea and thanks for the inspiration. Glad you finally got a chance to play just for fun and the result is fabulous. Love the quote, all the wonderful stenciling and great texture. Fantastic journal spread Sue, looks like you had a wonderful crafty play day. amazing page, and fabulous quote!! Fantastic pages, Sue - so full of life and drama. So glad you had some time to just play (oh, how I hear you on the deadline front... I may have to do something about that), and what amazing results.